My kitchen is to Rice’s kitchen as mountains are to molehills. Please see photo evidence A, B, and C.
Exhibit A, B: Views from the entryway (A) and the back door (B). Ignore the piles of recycling... nothing to see here, move along. As you can see Exhibit A and B, I have a ginormous kitchen. Kitchens are a deal breaker for me. 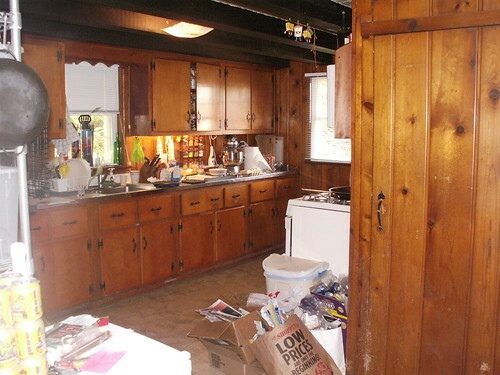 A house could have been made by Moses himself, but if it doesn’t have a decent kitchen… sorry, I’ll keep looking. I didn’t grow up in the craziness of Rice’s multiple cooling-unit kitchen. We had a regular fridge and a nice huge chest freezer in the basement. I do miss that. My apartment in college had one. It was fantastic! We kept everything in there. Including shoes (long story, but after a very drunken Halloween party, a roommate decided her feet were hot and froze her shoes. We found them a month later). Anyway, while it’s not quite as cool, we do have a beer fridge (Exhibit C). 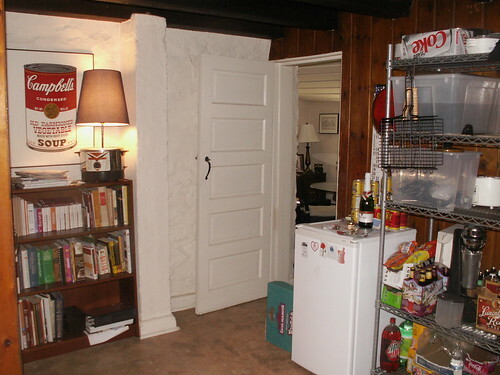 Exhibit C: Cookbook nook and beer fridge. Check out the neat old-school milkshake maker (bottom right corner) from Craigslist. It makes excellent smoothies! The mini fridge got me through a year in the dorms at the East Baltimore location of Hopkins. While my education was spectacular, my eating wasn’t. There are no grocery stores in bad neighborhoods. None! We did have a little food market, but it had strange hours. Anyway, when I moved back in with my partner and into a better neighborhood, he suggested getting rid of it. Foolish. I fully support segregating sodas and beer from the rest of the fridge. 1. It’s more convenient, 2. Beverages should not get in the way of food. Now we’re both happy. I get the whole big fridge, and his beer stays cold and closer to the living room. Win-win. Anyway, please check out my cozy Cookbook Nook (yeah, I’m nerdy). We bought a bookshelf that was too big for the living room, so I got it for my cookbooks!!! The pic is kinda small, but the lamp is made out of a crock pot! We bought that while drunk at the Andersonville neighborhood’s Summerfest in Chicago. So, in short, I have copious amounts of space for things like onions (unlike Rice’s kitchen). Unfortunately, I also have copious amounts of mold. It’s rather gross. Bleach is my friend. I envy people with large kitchens: ones with the hanging pan rack full of copper pots that shine like brand new pennies and marble counter tops, on their kitchen islands no less. But this I do not have. 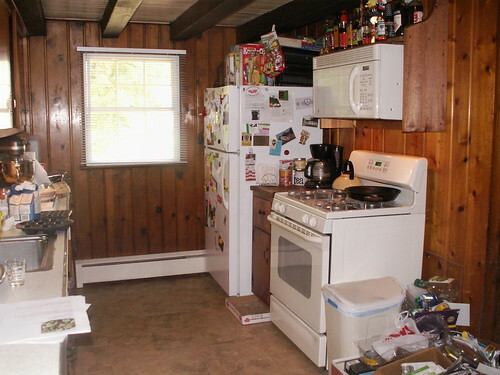 I have an apartment in Baltimore with a kitchen the size of most people’s half bathrooms. Ironically enough, my parents in Wisconsin, in their new house that they designed, have not one, but five refrigerators and freezers, and not one, but two kitchens! They only use one of them. The other one is for “show.” Last Thanksgiving my mom freaked out when I dumped some flat soda down the sink. One must not compromise the sanctity of the sink! But you work with what you have, learn to creatively stack things on top of other things, and run from room to room to find a flat space where you can chop up copious amounts of onions while keeping your cats from pouncing all over your produce.